Rewind to 1991. Taiwan. I’m four years old (eek I dated myself, forgive me…) and everything smells like fish. Which is an ok thing because I love fish, just not fish heads or fish eyes which our hosts (friends of my parents) keep trying to get me to eat. My mom says it’s a delicacy, but still, I’m not going there. Every day I’d spend chunks of time at the Taiwanese-American school our hosts ran and every lunch an old woman with a ton of wrinkles (or so I remember) served up plates of dumplings. 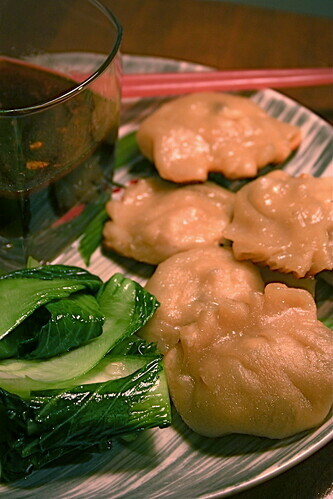 Pork filled, spicy, gooey-doughed dumplings. I was in heaven. Last night I recreated that moment. Sans pork. And you know what’s funny? As soon as I threw the spring onions, soy sauce, carrots, mushrooms, and tofu together in a bowl, the same smell I smelled every day in Taiwan for two weeks came back to me. It’s not like I haven’t eaten dumplings over the past 18 years since 1991, but there was something distinctly Taiwanesey about the combo. Or four-year-oldesy. Give or take a sniff or two. And while I loved those dumplings then, I think I’ve found a new soul-mate. In pot-sticker form. You know I love a good fried food. Oh, and for six years following our trip to Taiwan, I refused to eat fish. My brother still hates fish to this day. I think there was something a little too pervasive about the smell. Good thing I’m a vegan now! In a medium-sized bowl pour the water into the flour. Mix with a spoon until mostly combined, then dump the mixture out on a floured surface. Knead the dough for five minutes until a soft, smooth dough forms. Divide the dough in half and roll out 12″ logs. Slice the logs into 1/2″ slices. Smoosh each slice with the palm of your hand until a thin, round circle is made. In a small bowl, crumble to tofu into the carrots, onions, mushrooms, soy sauce, and sesame oil. Mix with your hands until well combined. Take one wrapper and fill with a scant teaspoon of the mixture. Fold in half and pinch the sides closed. Pinch five times across the top to make pleats which will hold the dumpling closed. For a good picture tutorial, check out The Vegan Ronin’s here. Set aside on a floured tray. Heat a large nonstick skillet until very hot. Add 1 tbsp vegetable oil and coat all surfaces of the skillet. Place 12 dumplings (or however many you can fit) in the skillet and cook for 2 minutes or until the bottoms of the dumplings are golden brown. Add 1/2 a cup of water to the skillet (it will sizzle and pop and steam like none other) and cover with a lid. Cook for 5-7 minutes or until the water is absorbed. Serve with a spicy dipping sauce of your choice! Cut the very end of the bok choy off. Peel the leaves off, but leave the “baby” found in the very inside of the vegetable intact. Make sure to wash each leaf. In a large unheated wok, place the ginger and garlic. Add 1 tbsp vegetable oil. Turn the heat to medium-high and allow the ginger and garlic to cook in the oil until the oil becomes very aromatic and the garlic is just turning light brown. Add the bok choy and cook for 15 seconds, making sure that each leaf is covered in the oil-garlic-ginger mixture. Add 3 tbsp water, cover the wok, and let cook for 1 minute. Drizzle with sesame oil and salt to taste. I love pot stickers but I’ve never made my own wrappers. These look really great – and easier than I imagined – so now you’ve inspired me to do so! fish smell really gets to me, too – and fish heads = eek! when i visit our asian market here in richmond i try to avoid glancing over at the fishy heads. they creep me out a good bit (and make me sadfaced). i also love how certain smells can take you back…(when i smell a pink eraser i’m transported right back to the first grade!) and aren’t pot stickers the absolute best!?! i love that you can vary up the dipping sauces and the stuffings, too! what’s not to love about them! little doughy goodnesses filled with yummies! mmmmmmm! i don’t think i’ve ever made bok choy before – i see it all the time & never think to pick any up. gonna have to change that! thanks! I absolutely adore pot-stickers, Jes, and am eager to give your recipe a try. I never made the wrappers before, but I’ve made enough ravioli to dive right into your recipe! Ooooohhhh pot stickers! I don’t think I’ve had those in at least 10 years or more! If I can snag me some tofu I think I’ll be making these! you make those sound so luscious… I have to make some potstickers for chinese new years I think! oh, and I love your sledding photos. I went recently and *froze* but I still had the time of my life. Wow those look great! Thanks for posting the recipe I can’t wait to try these! Pot stickers are absolutely comfort food to me, and yet I rarely make them. These sound so good…! Mm I haven’t had pot stickers in such a long time. This is some good inspiration! I used to make potstickers and dumplings all the time before going vegan. Now I can’t find any wrappers without egg in them. I always figured it would be a pain to make my own, but this recipe sounds easy. You’ve inspired me to go for it! I love dumplings. I always just steam or boil the dumplings and I’ve never made pre-fried potstickers! I will definitely make this! Yum! Yum! I heart potstickers so much!